The following Letter to the Editor was submitted by Daniel Berkland, an Ashton Heights resident who was recently involved in an accident on a Bird electric scooter. 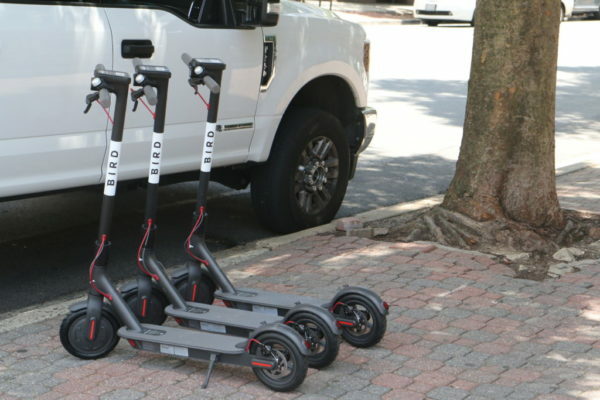 The dockless vehicles first arrived in Arlington in June, and county officials are planning to unveil a new policy governing their use later this month, as scooter-related injuries appear to be on the rise as the vehicles gain popularity nationwide. On Labor Day afternoon I was in Clarendon when I decided it was time to go home. I texted my daughter and told her that I was on my way. Then I saw a Bird scooter and thought to myself it is so hot I really want to just ride this scooter home. I rented the device and was soon on my way. About six blocks from home I turned down Irving because I thought it would be safer not to ride on the busier Wilson Boulevard. I noticed a couple of trucks coming towards me and I remember slowing down — that is my final memory until I woke up in the EMS vehicle. They were taking my vitals and asking me what year it was – a question that I could not answer. I was transported to GW Hospital because I had passed out and had a concussion. There I received a CT scan and a bed. They kept me over night so they could do a follow up scan and monitor my condition. The good news is there was no bleeding in my brain and I could be released. The bad news was I had bruises on my head, shoulder, hands, elbows, and knees. I am going to be stiff and sore for quite a while. I’m getting a little better every day, but anyone who has been in this condition will recognize the special horror that is sneezing when one is hurt like this. The pain is simply excruciating. The very worst part was I was given an alias when I checked into GW Hospital so my family couldn’t find me for a couple of hours. A terrifying experience for them while I was in the ER. I also want to give special thanks to the unknown neighbor who called 911 for me. Who knows how long I would have lain there without someone’s intervention. I owe you one! So take my unsolicited advice – stay off the scooters. While they may be convenient, they can also be very dangerous! Walking is good for you. A postscript after this appeared in the Ashton Heights newsletter — the kind neighbor who helped me out was Doug Williams, the AHCA treasurer. Neighbors helping neighbors is what Ashton Heights is all about! ARLnow.com occasionally publishes thoughtful letters to the editor about issues of local interest. To submit a letter to the editor for consideration, please email it to [email protected] Letters may be edited for content and brevity.